The herb garden at StoneGable is growing riotously! It’s happy and lush and each plant is pushing out more and more beautiful and tasty leaves. Even our dill which usually gives up well before now, is putting out some gorgeous dill flowers! To say, I have an over abundance is an understatement! 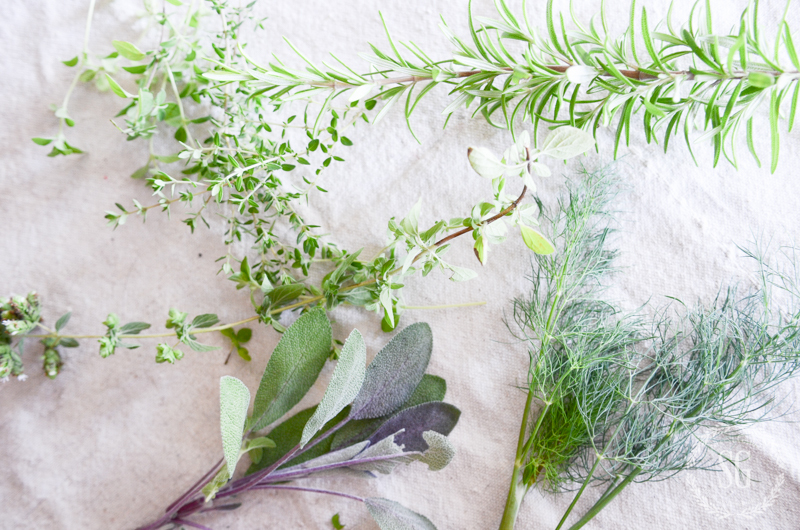 So what does a country girl do with all those gorgeous herbs? This year I’m freezing herbs and saving all that summer freshness to be used year long in my recipes. 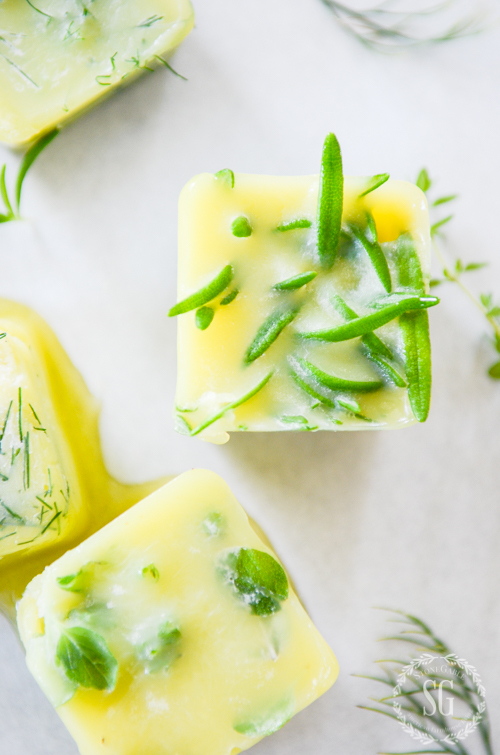 Freezing herbs is so so easy and it is very budget-wise. Let’s pack our freezer with summer goodness! Today I picked a few sprigs of dill, rosemary, oregano, thyme and sage from my kitchen garden just outside my back door. I chose hardier herbs to freeze. After washing them and letting the herbs air dry I pulled the smaller leaf herbs from their stems and filled my silicone ice cube trays with them. The larger leaves got chopped up and also put in the tray! I use these fabulous ice cube trays all the time. I freeze leftover sauces, gravies, anchovies, tomato paste etc in them! You can see more about them at the bottom of the page. 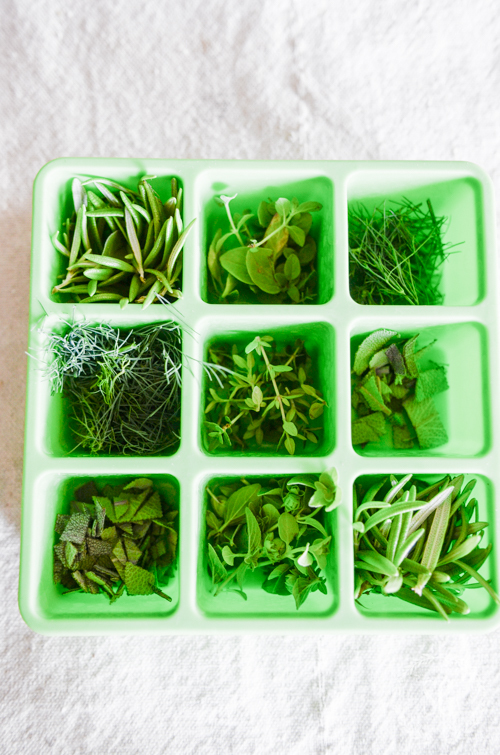 Once the herbs are in the trays I filled each cube with olive oil, put on the lid and put them in the freezer. When they were frozen I popped the frozen herb cubes out of the trays. So pretty! I took a just a minute to snap a few pictures before getting them into a Mason jar! The cubes will begin to melt fast so get them into a freezer bag, container or Mason jar and keep them in the freezer until ready to use. Herbs preserve much better in the oil and retain their flavor and do not get freezer burn. Another big bonus… the herbs infuse the oil with their wonderful fresh flavor! These beautiful little cubes of herby goodness can be dropped into soups, stews, whisked into salad dressings, made into marinades and more! If you don’t have a kitchen herb garden and buy herbs at the grocer’s you know how quickly they go bad! So before they turn, make sure to freeze them! 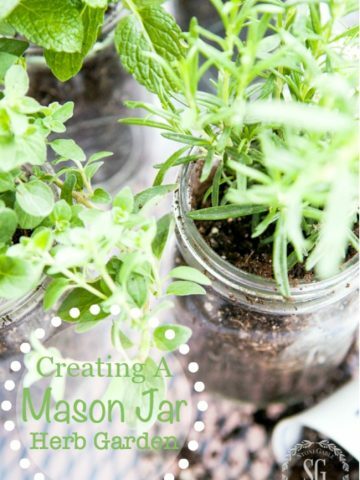 Do you have a tips for preserving herbs? Share them with our community! You might like to follow me on Pinterest or Instagram and see what I am pinning daily! I so appreciate this idea. I cook all the time, and when I have cilantro, I usually have to scramble to use it all up before it goes bad. I will definitely use this to make the most of my fresh herbs. Excellent idea–thank you! 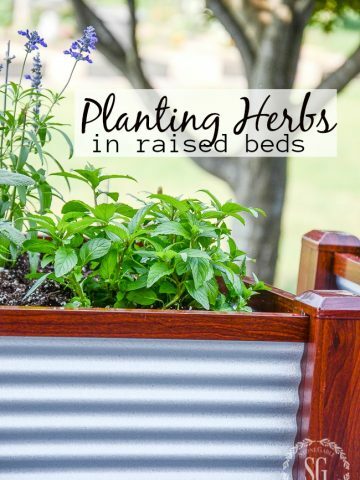 Great idea for summer herbs! So excited to try this! Just purchased an ice cube tray and all set to preserved the herbs in by strawberry jar! Great idea! Thanks for the directions! This is such a good reminder for this time of year! Thanks for sharing. I have just planted my first indoor herb garden. Not feeling too good about it yet. You have given me patience and inspiration. Thanks so much for the great way to freeze them once they start growing. I love this idea! Would love to see some garden photos this year! I’d really want to make your apron hanger – it is so adorable. Can you share how you made it? So many good tips! I’m going to start doing this…I’ve never thought to freeze herbs with olive oil, plus freeze my leftover tomato paste in cube size amounts. I love the idea of using my jars to store the frozen herb cubes, too. Thank you so much for this wonderful idea! I have the same little silicone trays. I like to make chive butter and basil butter and freeze them. We use the chive butter for baked potatoes and bread. The basil butter is great on pasta! Great idea!! I’m assuming butter would work as well as olive oil…according to the comments!! My joy each day is reading SG?? Brilliant!I will be trying this today. This is one of the best tips I have received about herbs, they grow in abbundance during the summer and you can never use them all up! i will be doing this for sure, Thank you for this tip and all the wonderful posts on your blog. 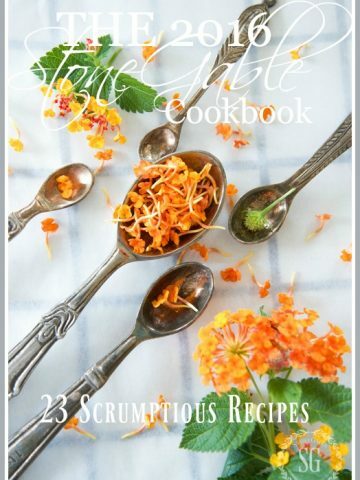 Love all the recipes and ideas I get from stonegable. Thanks for the wonderful hint! I have been looking at my herbs and thinking I could never use them all up! Will definitely try this. Hello, I love the cube trays. There are 2 different products listed. I love the idea of using a lid. Do you use the larger “king cube” tray or the smaller tovolo tray. 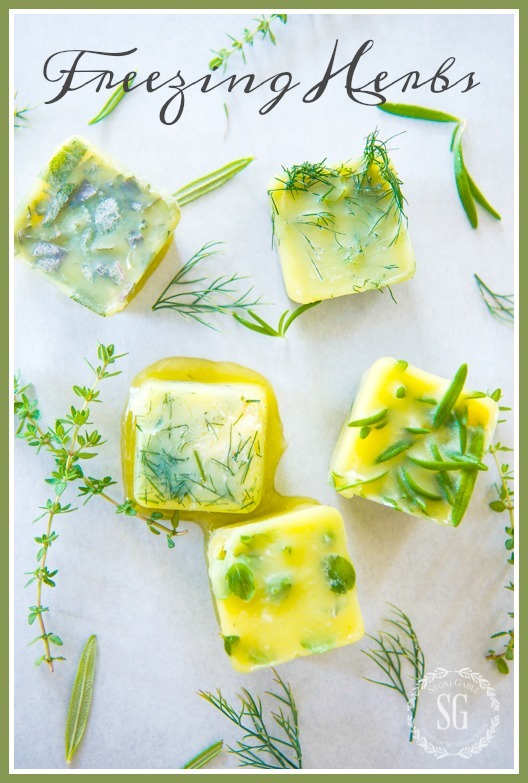 They look pretty!….Never thought to freeze herbs with olive oil!….Great idea! I have been doing that for years, they keep really well in the freezer and your food will be extra tasty! Wow! 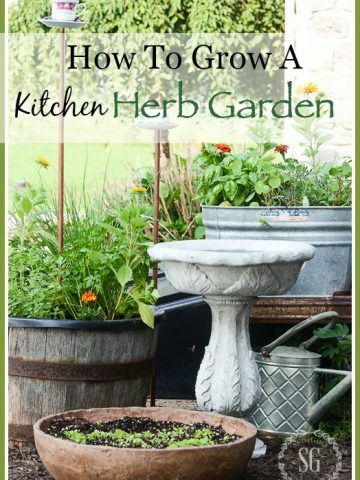 What a timely post since my husband’s herb garden is overflowing with goodness. Never thought to freeze them in EVOO. How perfect. We’re gonna try this tomorrow. Great idea. Will this work with basil? I grow a lot of herbs and love your idea about the ice cubes. Will pick some herbs today and let them dry. I also like to do various herb butters ,roll them into log shapes in wax paper and freeze those too. Great for bring out for the holidays or when I make homemade bread. Yummy!! Thanks for your inspirational ideas and great photos. Yummy! I love herb butters! Great tips, Yvonne! I’ve been wondering about the best way to freeze my rosemary. This is really an awesome idea Yvonne! Thank you for sharing. What do you consider are the hardy herbs to freeze. Thanks for ideas on freezing herbs gonna try they I have some left in pos outside !!! 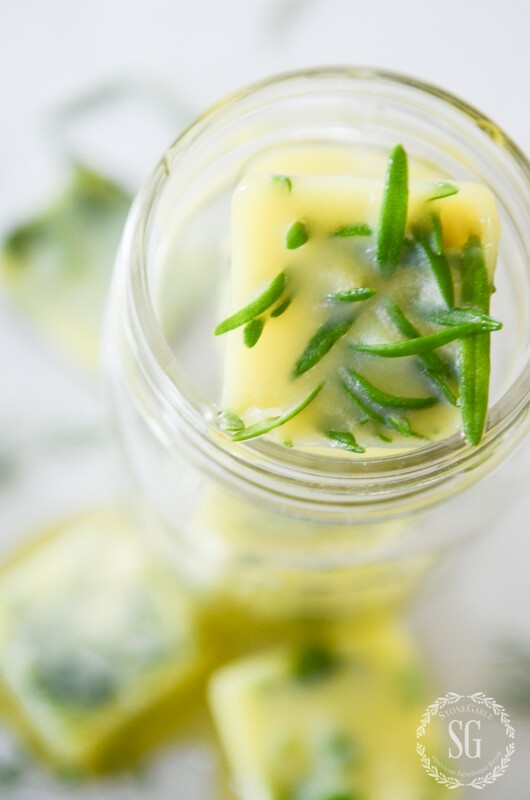 I freeze everything it seems – but never thought about freezing Herbs in EVOO – what a wonderful and savory idea. I’d also like to add something having nothing to do with today’s blog……however, everything to do with SG. I had a dinner party Friday night and called it StoneGable. First made, Whipped Body Butter, as a little “happy” gift to each of the ladies, then served the Pepperoni Artichoke Breadstick Focaccia, Cucumber Salad, StoneGable Pasta Salad in a Jar (used pint size and what they didn’t eat, each took their jar home) and Starbucks Inspired Lemon Loaf Cake. All recipes from your blog. We had pork tenderloin, but used our recipe. Using new and first time recipes for a dinner party is kind of a brave thing – but I knew if they were yours – it would be great and everyone LOVED everything. Thank you. I have been drying some herbs in the microwave with great success! This looks like a great idea! I have a question. Your directions toward the end states, “The cubes will begin to melt fast so get them into a freezer bag, container or Mason jar and keep them in the frig until ready to use”. My question is do I store them in the fridge or the freezer? Thank you! Love your home! Sorry Pat, I meant freezer. I’ll make that that correction. Thanks so much for the great tip. Most summers I make pesto and freeze it in ice cube trays to use during soup weather but never considered other herbs. Easy, peasy and it will give me a better selection of flavors for soups and sauces. You are the greatest. This is such a great idea! I can’t keep up with my basil and rosemary plants and I’m so happy to learn that I can preserve them in the freezer- GENIUS!